The geography of Portugal is generally mountainous, especially in the north of the country where the Serra da Estrela mountain range dominates. Portugal’s highest point on the mainland is found at Torre in the Serra da Estrela mountain range, which reaches 6,539 feet (1,993 metres). Portugal’s lowest elevation is found at the coastline of the Atlantic Ocean. The highest point in all of Portugal is found in the Azores at Mount Pico, which measures 7,713 feet (2,351 metres). The Algarve region in Portugal’s far-south is characterized by low rolling plains, sparse mountains and some islands and islets. Its coastline is notable for limestone caves and grottoes. The Tagus (645 miles/1,038 km), the Douro (577 miles/928 km), the Guadiana (508 miles/928 km), and the Mondego (161 miles/259 km) are amongst the longest rivers in Portugal. Of these rivers, only the Mondego is located entirely in Portugal. The rest of the rivers are shared with Spain. 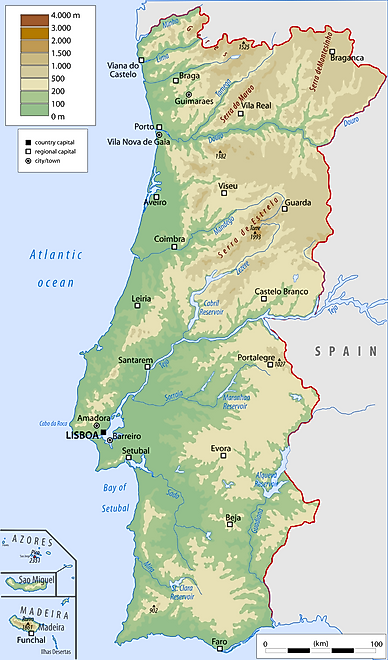 There are no inland lakes in Portugal.